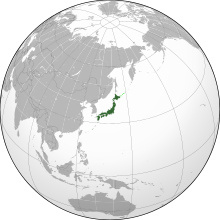 Japan (Japanese: 日本 Nippon [nip̚põ̞ɴ] or Nihon [nihõ̞ɴ]; formally 日本国 Nippon-koku or Nihon-koku, “State of Japan”) is an island country in East Asia. Located in the Pacific Ocean, it lies to the east of the Sea of Japan, the East China Sea, China, Korea and Russia, stretching from the Sea of Okhotsk in the north to the East China Sea and Taiwan in the southwest. The kanji that make up Japan’s namemean “sun origin”, and it is often called the “Land of the Rising Sun”. Japan is a stratovolcanic archipelago of 6,852 islands. The four largest are Honshu, Hokkaido, Kyushu and Shikoku, which make up about ninety-seven percent of Japan’s land area. The country is divided into 47 prefectures in eight regions. The population of 127 million is the world’s tenth largest. Japanese people make up 98.5% of Japan’s total population. Approximately 9.1 million people live in the core city of Tokyo, the capital of Japan. The Second Sino-Japanese War of 1937 expanded into part of World War II in 1941, which came to an end in 1945 following the atomic bombings of Hiroshima and Nagasaki. Since adopting its revised constitution in 1947, Japan has maintained a unitary constitutional monarchy with an Emperor and an elected legislature called the National Diet. Japan is a member of the UN, the G7, the G8, and the G20 and is considered a great power. The country has the world’s third-largest economy by nominal GDP and the world’s fourth-largest economy by purchasing power parity. It is also the world’s fourth-largest exporter and fourth-largest importer. The country benefits from a highly skilled workforce and is among the most educated countries in the world with the one of the highest percentage of its citizens holding a tertiary education degree. Although Japan has officially renounced its right to declare war, it maintains a modern military with the world’s eighth largest military budget, used for self-defense and peacekeeping roles. Japan is a developed country with a very high standard of living and Human Development Index whose population enjoys the highest life expectancy and the third lowest infant mortality in the world.